A few years ago I was introduced to Lean concepts and principles at work. After several months of studying the topic I realized that many of my professional activities for both managing processes and people already mapped to some of the core components of Lean. That makes sense as many of the leading management philosophies and programs of our time share foundational elements. 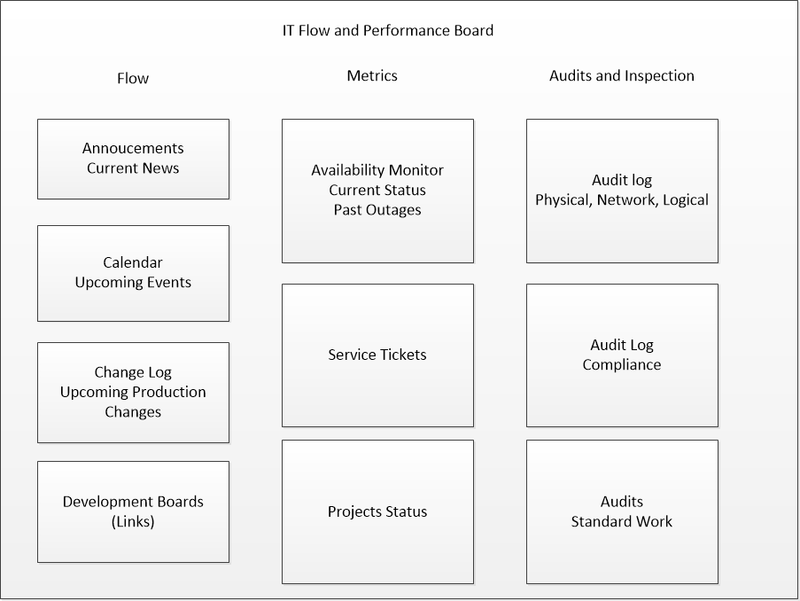 On my personal Lean journey, my next task is to develop a Flow and Performance Board. This will be a form of visual management that displays information to use at recurring team meetings. The contents on the board support the Lean principles of continuous flow and reducing waste. Effectively, the board becomes a visual control to see how flow of product is progressing for customer value-added activities and where waste exists in the system. Show elements of product flow – At what stage work is in the system. Show key metrics – If possible show actual vs expected. The focus of the board, and Lean, is process flow and eliminating waste (as opposed to traditional boards that focus only on results). Show flow influencers – These are items that may influence the production system such as holidays and customer audits. The intent is to make the influencers visible ahead of time so it’s possible to manage through them instead of reacting to them. Show audit results – Part of the Lean journey is having leaders that inspect our work to see if we are following standard process. IT also has a rapidly growing set of requirements for compliance, which customers require, that fits in this space. Since IT team members are geographically dispersed and most of our tools report data electronically then this will be an electronic board. Content will vary for different groups within IT. My first board is targeted towards and enterprise level view. The board is intended to be referenced during recurring team meetings so that team members have a visual control as they inspect pieces of the product flow. As such, it should be easy to read and process information. The contents of the board must be current to be relevant. Ideally the board will updated dynamically to reduce the amount of non value-add work of administrative processes. I anticipate I will wrestle with screen real-estate, content, and compactness with each future iteration. Earlier this week I had lunch with @Cjack_HC, @ElliotLeson, @Westdene64, and a few others. I joined the lunch late as the group was in the middle of a brainstorming session on creating names for business card designs. Sounds easy, but I found the task pretty challenging. It made me think of the age old question “Is creative accidental or thoughtful? 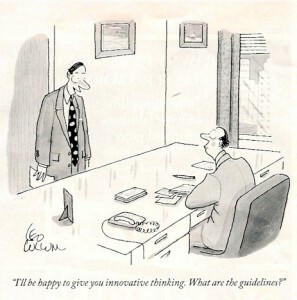 I'll be happy to give you innovative thinking. What are the guidelines? Today, during drive time commute with the carpool gang, a similar question was asked. “Can you have a process around innovation?” At first thought the two words seem to contradict each other. So an innovation process would be a series a actions conducing to an end that introduces something new. The rub is that process implies a repeatable action. Process provides for a constraining framework that limits non-standard results. Yet innovation is the ability to create something new and implies a change in thought. Innovation isn’t constrained by boundaries. Innovation encourages failure so that future ideas are stronger, while process requires following a series of pre-defined actions and penalizes failure to do so. After thinking on this a bit more, I believe an innovation process is more of a system that combines a structured framework to help achieve ideas conceived in an unconstrained environment. But there’s a catch. The innovation in the system applies not only to the ability to think of new ideas in an unconstrained manner, but the ability to implement those ideas through incremental improvements or adjustments to existing processes. By definition, an innovative idea is something new. So it’s possible that implementing the new idea won’t fit in the boundaries of an existing process. That said, process has a definite place in business and adds value because of its repeatability. The process provides for a system of performance excellence. A company will need to use elements of its predefined processes for optimal achievement of innovative ideas. I believe an innovation process is something that can be used as a value proposition for client relationships. A company can prove it has an innovation process in place by showing a regular pipeline of both ideas and implemented ideas. This is valuable to clients and prospects because it shows a well rounded company that contains a base of stability with an edge of creativity. It’s the sign of a company that keeps a fresh set of products and services entering the product life-cycle. So back to those business cards. What do you think? Is creative accidental or thoughtful? Question: Should we rely on serendipity or a managed process for incremental innovation? I’ve been asked to answer this question as part of an assignment. I thought it would be good to record the answer here. It’s not because I think my answer is anything great or has uncovered some train of thought that no one else has wrestled to understand. In fact, I see blogs, podcasts, and the like on creative thought versus process all the time. But this is my sounding board and place for me to record thoughts. I’d welcome yours. Man, by nature, wants life to be very rhythmic and loves to have patterns of repeatability. This is a core essence of education and learning in society. You learn a principal that should be repeatable and hold true for completing tasks. The scientific method? Mathematical formulas? Yet, despite his best efforts, there are well documented occurrences of meaningful inventions and ideas that were discovered by accidental events. Serendipity is by definition, the act of finding one thing while looking for something completely different. Both serendipity and managed processes have their place in life. One planned, the other not. For a practitioner, this work flow serves almost as a checklist to guide decisions that ultimately reach an end. In the case of product/service innovation that could be termination of an idea during evaluation or it could to lead to the launch of a new product. Each process step is created and put into place as the result of a learning experienced during a previous run through of the work flow. As the process matures, with additional iterations, it should become more refined and suited for producing predictable output. This works well for big business where management and shareholders do not like surprises. In that environment, management supports and develops processes to control predictability and minimize risk and surprises. In this example, it would be easy for practitioners to spend a large portion of their time filling out paper work and trying to attain approvals. They can lose site of the ultimate goal for the sake of a checklist. It’s not long before innovation and creative thought starts to get lost . Charles Goodyear discovers rubber when he accidentally leaves a piece of rubber mixture with sulfur on a hot plate. Aspartame, or Nutrasweet, was accidentally ingested by James Sch latter while trying to develop a test for an anti-ulcer drug. Corn Flakes was invented by the Kellogg brothers in 1898 after they left cooked wheat unattended for a day. They later tried to roll it but became flaky instead of rolling into a mass. 1. For organizations: Create a culture of innovation by encouraging new ideas, not punishing failures, reducing bureaucracy, and educating employees. Process is good to provide a framework for innovation, but don’t let the process choke the creative nature of your people. 2. For individuals: Develop routines and rhythms that encourage creative thought. Make sure you set aside time to think, research, explore, and educate yourself. Doing these two things leverages the advantages of a ‘managed process’ while at the same time encouraging creativity. Serendipity? Well, would you rather be good or lucky?